It was on this date 150 years ago – November 19, 1863 – that Abraham Lincoln gave the most important speech in American history. Yes, I know there are plenty of other nominees for that honor: John Kennedy’s Inaugural, and “Ask not;” Martin Luther King, Jr., and “I have a dream;” FDR and “Fear itself;” even Lincoln’s Second Inaugural and “Malice towards none.” And as important as those speeches – and many others – were, none have had the lasting impact on our national identity and purpose as the Gettysburg Address. 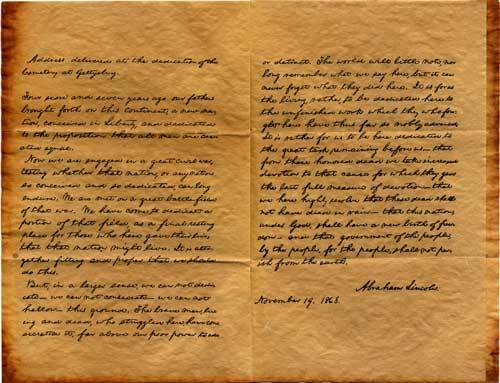 In this speech, President Lincoln redefined and refocused the reason for the Great Struggle, he provided comfort for a nation reeling from staggering losses; he took what had been a relatively obscure line from the Declaration of Independence and made it a national mantra, and once and for all seized the moral high ground in the war. 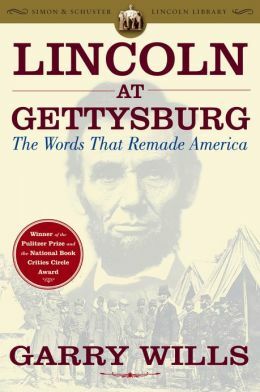 And the fact that Lincoln did all this using only 272 words is a reminder that when it comes to words, it’s quality, not quantity, that matters. There was a time when school children had to memorize it. In my case, it was in Mrs. Thigpen’s eighth grade class at Orangefield Junior High. Some may still have to commit it to memory, at least long enough to pass the test. Good for them. Like any great historical event, numerous myths surround the speech and its delivery. For one thing, Lincoln did NOT compose it on the back of an envelope on the train ride up from Washington, nor did he scribble down a few thoughts at the boarding house where he stayed the night before the speech. The historical evidence shows that he had already completed at least one or two rough drafts of the speech that he had shown to some of his friends and advisers before he ever left the Executive Mansion (as the White House was called in those days). Another enduring myth is that the speech was a flop when it was first delivered, and the crowd was visibly displeased with it. Not so. It’s true that newspaper editorials about the speech differed widely in their reviews of it, but generally broke along party lines – most Republican papers praised and endorsed it, while most Democratic papers dismissed it. It’s true that it was short. But then, it was supposed to be. Dedication of the new cemetery at Gettysburg was primarily a state function, and national involvement was not considered necessary or automatic. The main speaker at the dedication was Sen. Edward Everett of Massachusetts, perhaps the most skilled orator of the time, who spoke for over two hours, reviewing the battle, condemning the Rebels and praising the Union. President Lincoln had been invited only to give a few brief remarks, and nothing more was expected. It’s hard for us today to appreciate what a different time it was, politically. But if you know our nation’s history, you know that the framers of the republic didn’t know what to do about slavery, and since they couldn’t agree on a solution, they basically just punted that particular ball to a future generation. The Constitution says that a black man counts as 3/5 of a person when it comes to the census. It’s not clear just what the framers originally meant when they wrote, “All men are created equal,” but to one extent or another, they were thinking educated, white, landowning males. Authors use words to create the reality of other worlds in their books as they write; good speakers can do the same, helping see things “as they could be.” And so in this speech, Lincoln took the Declaration’s words about equality and breathed new life into them. He redefined a war that had been about political theory, economics and states’ rights, and turned it into a moral struggle for liberty for all. To this day, we’re still debating some of those issues. 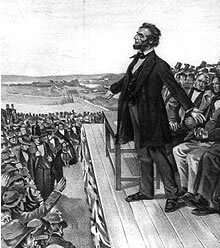 Out of all the books written about the Gettysburg Address, I think the best is Garry Wills’ Lincoln at Gettysburg. Prof. Wills is, in my opinion, a really great historian, and I’ve read and enjoyed several of his books, including John Wayne’s America. But he received a Pulitzer Prize for Lincoln at Gettysburg, and I think the committee got it right. If you enjoy American or Civil War history, or want to better understand how to use language effectively, I highly recommend it. There are five versions of the speech with slight variations. Here is best known version, which the President himself wrote out and signed. I would say the President was wrong about one thing: the world has indeed long noted what he said. And rightfully so.